Sweet potato works extremely well in sushi. It does so especially when used as topping for an inside-out roll. Its color is naturally vivid and thus contributes much to the aesthetic effort. Sweet potato can also be used for sushi roll filling, with or without tempura – it works very well, especially for veggie rolls as the main filling. Since it is a hard root vegetable, the sweet potato requires some preparation in order to be used in a sushi dish. Below you can find some suggestions how to do so. 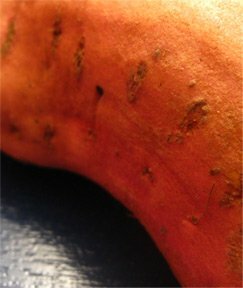 Wash the sweet potato thoroughly, and remove the skin with a peeler. Use the peeler to slice thin slices of the sweet potato. Peel them as big as you can. Fry the slices for a few seconds in hot oil. After frying, let cool for a few minutes. Refrain from laying the fried slices on top of each other, it tends to cling. Once chilled, cover an uncut inside roll with fried sweet potato slices, and tighten with the bamboo mat.